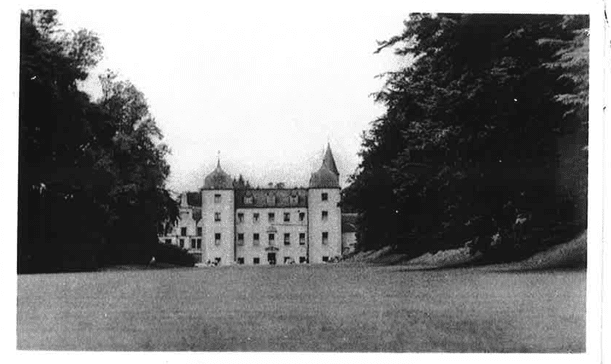 Barony Castle was originally known as Darnhall and stands in spacious grounds west of Eddleston village in Tweeddale. The earliest known building on the site was a fortified dwelling dating to the early 15th century; one of a dozen such in the Eddleston Valley. These Peel (Reiver) Towers were an essential defence during these lawless times, when attacks could come from invading English or from Reiving clans. In 1506 John Murray of Fallahill was granted the estate of Haltoun by King James IV and given the title Laird of Blackbarony; to celebrate, he had a bell cast for the local church in 1507. Sir John died at his royal master’s side at Flodden in 1513; his son Andrew acquired the estate and title and set his sights on the neighbouring property of Darnhall. In 1536 a Scots’ baronial style building was erected on the site of the old peel tower which retained the name of Darnhall. At the close of the 16th century Sir John Murray of Blackbarony took to enclosing his fields with stone walls following the last Reiver raid into the area in 1581. This earned him the sobriquet of “John the Dyker”. In 1629 Sir Archibald Murray was commissioned to hold court to try witches, three were found locally but their fate is not recorded. The name of the hill to the north of the castle has been linked with their fate, “Gallows Law”, but it appears the name has its origins in the 14th and 15th century right of “pit and gallows”; when landowners had the right to imprison or hang trespassers, vagrants or miscreants. To the south of the house stands the Motte Knowe; an earthwork from which the Laird dispensed judgement, but which may be far older than Darnhall. Sir Archibald’s son, Sir Alexander ‘the Magnificent’, had a taste for extravagant and lavish entertaining. 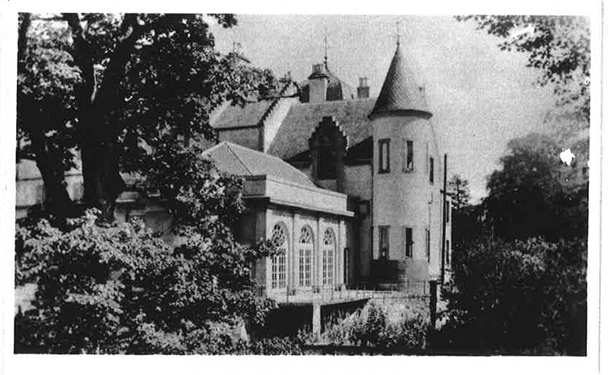 The house, although not large inside, contained some fine furniture which guests were given plenty of opportunity to admire together with the eccentric laird’s gorgeous appearance. In order to further impress, he equipped a number of local lads with expensive liveries. He taught them to ‘hold up their heads and look big’ and placed them under the trees on either side of the Limes Avenue. As the visiting retinue passed along the drive (still to be seen to the north of the present drive) the youngsters would run up a hidden track to the house; enter by the back door, change to the “household livery” and line the stairs and entrance hall. Throughout the 17th century the power and influence of the Murrays of Blackbarony increased until Sir Alexander was the proprietor of practically the whole parish including the White Barony to the east of Eddleston water. The Scot’s baronial style house was evidently deemed to be an inadequate expression of his status so, between the years 1700 and 1715, the laird built the French (Jacobean) façade which we recognise today. This spectacular edifice, reminiscent of a French chateau, was said to present a more elegant style (sic) of architecture than any seen in the county making the old house appear “regular and beautiful”. The revamped house, Darnhall, must have caused quite a stir among the locals. The remains of a vaulted cellar can still be seen in the entrance hall. The thickness of the walls in the lounge area give some sense of the solid structure of the original building.